EDITOR: Israel is preparing for its election with a war on Gaza, like four years ago! Like in 2008, Israel now stands ready for a new election campaign, with all its social systems seemingly broken, with the impressive tent protest of summer 2011 all but dead, and with no serious opposition on the left. The usual thing for an Israeli politician at election time is to start a war, like Olmert did in December 2008. Netanyahu is no different. This continuing massacre in Gaza, and the killing of Hamas’s military leader, is well planned in advance, and is there to serve Netanyahu. That the Israeli public is so fickle as to buy this old product every single time, is a sad fact of Israeli politics. Netanyahu has nothing to worry about – who is going to stop him? Surely not the heroic Obama, fresh out of defeating the even more pro-Israeli Romney. Netanyahu knows he is safe with Obama, like he was ever since he came to power. Obama talks, but does nothing, and he even upstaged Dubya as the most useless president on the Middle East and Palestine – a real honour. The real humiliation for Obama will be helping the man who openly supported Romney to be elected in Israel. The head of the military wing of the Palestinian Islamist group Hamas has been killed during a series of Israeli air strikes in the Gaza Strip. Ahmed Said Khalil al-Jabari and another Hamas official died when the car they were travelling in was hit in Gaza City. It was part of a wider Israeli operation against militant groups in the Hamas-run Gaza Strip. Outside the hospital where Mr Jabari’s body was taken, thousands of angry Gaza residents chanted “retaliation” and “We want you to hit Tel Aviv tonight”, according to the Associated Press news agency. Gaza’s interior ministry said a further four Palestinians had died in the attacks across Gaza. Militants in Gaza have fired more than 110 rockets towards southern Israel since Saturday, when four soldiers were wounded in an anti-tank missile attack on an Israeli army jeep. Before Wednesday’s operation, six Palestinians had been killed in the ensuing Israeli military strikes on the Gaza Strip in response. Israeli Defence Force (IDF) spokeswoman Lt Col Avital Leibovich said Mr Jabari had “a lot of blood on his hands”. She told BBC News that “close to 20″ sites in Gaza had been targeted in a “limited” operation, with the strikes aiming to destroy rocket-firing capabilities. Across Gaza there’s anger. There’s the sound of gunfire. The news is being broadcast from mosques. There are chaotic scenes at the city’s al-Shifa hospital. Ahmed Jabari was one of Hamas’s most senior figures. He was 46 years old and the head of the movement’s military wing, the al- Qassam brigades. He was hit by an air strike as he travelled in a car through the centre of Gaza City. 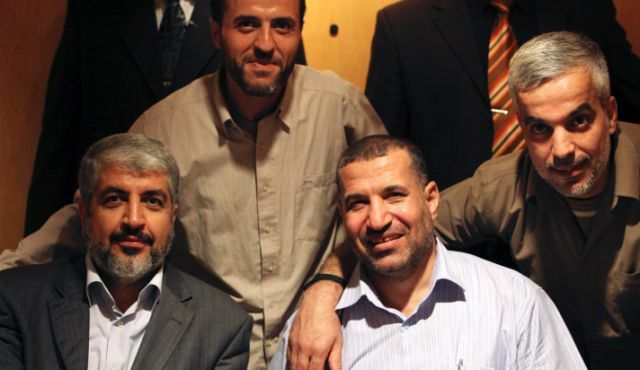 At least one other senior Hamas figure is thought to have died. Israel will say Hamas had it coming. Palestinians will see it a major provocation. The fears here are it could provoke another war. On its Twitter feed, the Israeli military said the operation could be escalated further. “All options are on the table. If necessary, the IDF is ready to initiate a ground operation in Gaza,” it said. “Jabari was responsible for financing and directing military operations and attacks against Israel. His elimination today is a message to Hamas officials in Gaza that if they continue promoting terrorism against Israel, they will be hurt,” it said. Saeb Erekat of the Palestinian Authority, which governs the separate West Bank territory, condemned the assassination “in the strongest terms”. “We hold Israel fully responsible for the consequences of this new act of aggression,” he added. Israel has killed several senior Hamas figures in similar operations, including the movement’s founder, Sheikh Ahmed Yassin, in 2004. The BBC’s Jon Donnison in Gaza City says the sound of gunfire echoed through the streets after mosques broadcast the news of Mr Jabari’s death. There are fears the attack could lead to a major escalation of violence between Hamas and Israel, he adds. Following the Israeli strikes, neighbouring Egypt’s foreign ministry issued a strongly critical statement. “Foreign Minister Mohamed Kamel Amr condemned the series of air strikes that Israel is currently conducting against Gaza Strip and which led to the killing of Ahmed al-Jabari,” it said. The BBC’s Kevin Connolly, in Cairo, says Egypt’s reaction to events in Gaza will be followed closely. UN Secretary General Ban Ki-moon called for an “immediate de-escalation of tensions”. This is not just ‘another’ assassination, but rather a hit on one of the top people in the movement and the person in the leadership most identified with the terror struggle against Israel. This time the Israeli warnings were spot on: The frequent threats made by Prime Minister Benjamin Netanyahu’s government to settle accounts with Hamas, in the context of the latest escalation in the Gaza Strip, were implemented on Wednesday afternoon with the assassination of Ahmed Jabari, head of the organization’s military arm. This is a resonant military action, far beyond the amplitude of the friction between the sides in recent days. In Hamas they understood that an Israeli response was expected – and therefore its heads on Tuesday went along with the Egyptian call to agree to a truce. However, it is doubtful that Hamas expected the response would be so harsh. This is not just “another” assassination (and there haven’t been assassinations of second tier activists in almost four years), but rather a hit on one of the top people in the movement and the person in the leadership most identified with the terror struggle against Israel. The Israeli action today is the beginning of the story, not its end. All of the Palestinian factions will try in the upcoming hours to avenge Jabari’s death by every means. The confusion of the first hour in Gaza is now being replaced by an unambiguous call for vengeance. Hamas and the Islamic jihad also have in their possession a small quantity of Fajr rockets smuggled from Iran, which have a range of 75 kilometers. When launched from the northern Gaza Strip, their range covers most of the area of Tel Aviv and the suburbs surrounding it. The Hamas leadership is most probably also weighing the use of this “Judgment Day” weapon. Attempting to prevent it, immediately after the strike Israel Air Force attacked some twenty underground sites, where both Hamas and Islamic Jihad hid Fajr rockets. The assault was meant to neutralize their mid-range capabilities, just as the IDF attacked Hezbollah in 2006 in what is since known as ‘the Fajr night’. In both incidents, the attacks used accurate intelligence which was carefully collected. But when Hamas threatens now to start a war, it should be taken into account this could happen, just as Hezbollah decided to react in 2006. For a long time now Israel has been pursuing a policy of containment in the Gaza Strip, limiting its response to the prolonged effort on the part of Hamas to dictate new rules of the game surrounding the fence, mainly in its attempt to prevent the entry of the IDF into the “perimeter,” the strip of a few hundred meters wide to the west of the fence. This time, Netanyahu and Defense Minister Ehud Barak have authorized the army and the Shin Bet security service a massive response. It is impossible, apparently, to ignore the contribution to this of the upcoming election in the background. Netanyahu has been fielding criticism for several weeks now for abandoning residents of the Gaza envelope communities to rocket barrages. Like former Prime Minister Ehud Olmert before him, upon embarking on Operation Cast Lead, he too is responding harshly on the eve of an election. Of course, the trouble with this story – the likes of which we have already experienced a number of times – is that in launching such a strong strike you know where you are starting from but not where it is going to end. Israel has in the past assassinated leaders of the “political” Hamas, who in actuality were involved in terror, like Ahmed Yassin and Abdel Aziz Rantisi. Israel had also hit many of the heads of the organization’s military wing. To a certain extent, these assassinations contributed to reining in Hamas in the long run as also to the choice on the part of its leadership in the Gaza Strip to rein in a wave of suicide attacks. Jabari, primarily after becoming close to the Egyptian regime and his role in finalizing the deal to release captive Israeli soldier Gilad Shalit, apparently believed he was immune to harm from Israel. His subordinates were also surprised. Their reaction is liable to be very violent – and lead in turn to more assassinations by Israel. Even if Netanyahu does not necessarily wants a wide-scale IDF ground operation in Gaza on the eve of the election (and the prime minister, pretty much rightly, has kept his intentions in this matter close to his chest), he might well be dragged into one, despite himself.